Demonstrators get a magazine each month with great ideas. Here are some cards inspired by the lastest issue. I was happy to see some ideas for the Frames with a Flourish set which I earned for FREE. The first card uses the 1 1/4 inch punch to punch out the inside of the frame so it can pop out with dimensionals. The heart is chipboard (May special coming up!). The middle card uses a frame for a background with some satin ribbon and pretties. 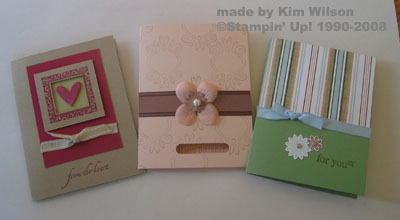 The last card uses the One of a Kind stamp set and the Boho Blossoms punch. I used the Afternoon Tea DSP, but the original sample was with Berry Bliss. This layout is very versatile! These are really nice! Beautifully made. The magazine is free to demonstrators.